Today I have another installment of Cooking for One which really should be called Cooking for Dummies, because let's face it, this is THAT basic. 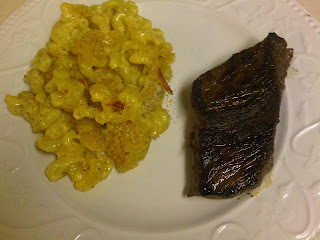 Last night, I tried my hand at something I had never, ever made before - macaroni and cheese. I'm not talking that about Kraft or Velveeta, okay? I was no stranger to the Easy Mac in college. This time, I wanted real, creamy, crunchy mac and cheese and I was gonna make it myself. Step one: make your macaroni. Cook it half the time the box recommends. Assuming that's 4 to 5 minutes, as soon as you put your pasta in the boiling water, melt some butter and some flour (she suggested 3 tbsp of each) in a pan. When that melts and thickens up, add some milk. She suggested a cup. It is very rare that I have milk in my household. The last time I had some was for my sister's visit in June, and before that I don't know. I just never buy it because I don't drink it. So assuming you have milk, add a cup. Whisk that together until it's thick. Toss in some cheese - I used sharp cheddar but I'm getting creative next time and doing a gouda blend or something crazy. Once the cheese is nice and incorporated, add salt and pepper to taste and keep stirring until your macaroni is ready. Drain the noodles, put them in your dish, pour cheese sauce on top and mix it up. I poured some breadcrumbs on top of mine for texture and baked it for 30 minutes on 350. Serve alongside a tasty petite sirloin and an episode of Rachel Zoe Project. DELICIOUS. In fact, I am heading home to have some more with my lunch. This looks yummy! I've also used this recipe from Martha - which is surprisingly easy. I'm about as anti-domestic as it gets and I thought it was pretty simple. Go try Paula Deen's Mac and Cheese... It is soooo good... And pretty easy.